Saudi Crown Prince Mohammed bin Salman’s arrival in Paris for a three-day visit has once again raised lawmakers’ concerns over French arms exports to Riyadh. “In conjunction with the Saudi authorities, France has initiated a new arms export strategy with Saudi Arabia, which until now has been managed by ODAS [the French agency, which is in charge of handling the country’s defense interests in Saudi Arabia],” a French defense ministry official said, as cited by Reuters. Salman’s visit comes amid increasing pressure on Emmanuel Macron from MPs, voicing concerns over France’s arms sales to Saudi Arabia, which is involved in the Yemeni war. Over a dozen lawmakers have pressed for an investigation into France’s weapons exports to Riyadh, having filed a request for a 30-member commission of inquiry into Paris’s complicity in the war on Yemen. 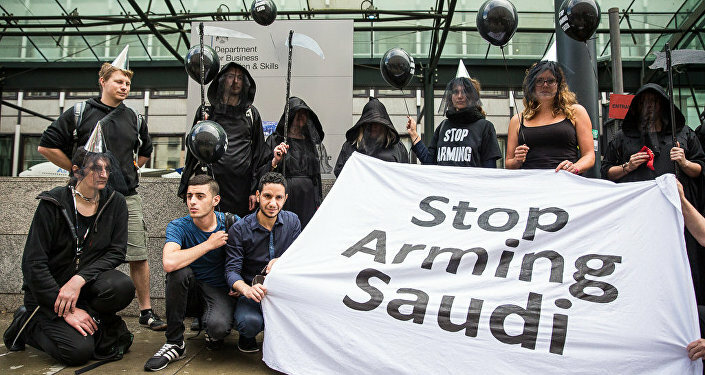 According to a member of parliament, Sebastien Nadot, the commission is “to study France’s compliance with international commitments regarding arms export licenses, munitions, training, services and assistance that our country has granted during these three years to the belligerents of the conflict in Yemen. What is ODAS and Why is it Being Eliminated? According to the Challenges outlet, French Defense Minister Florence Parly has ordered to “eliminate” the ODAS company, which was in charge of promoting French arms sales in Saudi Arabia. Daniel Argenson, head of the agency, has reportedly received a letter from the minister, informing that ODAS will only work on the existing contracts. This means that Paris has indulged Riyadh’s desire: Mohammed bin Salman has repeatedly stated that he did not want to cooperate with the company. Approximately 34 percent of ODAS is controlled by the government, while the remaining 66 is run by giant firms, such as Airbus, Dassault, Nexter, Thales, Naval Group, etc. One of ODAS senior staffers explained to Challenges the possible reason behind the government’s decision to stop cooperation with the agency. “The government couldn’t continue to act as if it didn’t hear the Crown Prince’s message,” he said. ODAS is still in charge of the Saudi-French Military Contract (SFMC), the former Donas contract, a 2.4 billion euro-worth ($2.95 billion) deal, which implies deliveries of 75 various ammunitions to Riyadh: Airbus helicopters Cougar, Caesar artillery cannons from Nexter, navy ships, Milan anti-tank missiles, VAB Mk3 armored vehicle from RTD. “There is no longer any need in such an agency as ODAS… There are no similar organizations in Qatar and Egypt, and this does not prevent France from achieving excellent results there,” said Éric Trappier, chairman and CEO of Dassault Aviation. While Macron is being pressured to suspend arms sales to Riyadh taking into consideration its involvement in the war in Yemen, some sources have told Challenges that the two countries might sign a 600 million euro-worth ($738 million) deal on some forty navy patrol boats manufactured by the shipyard of Mechanical Constructions of Normandy (CMN). Some French diplomats have also expressed their concerns over the prince’s rhetoric towards Iran and tough policies across the Middle East. “While Macron recognizes the reforming aspirations, he sees that MBS [Mohammed bin Salman] could be a real loose cannon and what he is doing in Yemen and Qatar and the talk on Iran has potential to add fuel to regional fire,” one of the diplomats said. Last week, 12 international NGOs, including Human Rights Watch and Amnesty International, send a private letter to Macron, calling to pressure the Crown Prince in order to ease a blockade on Yemeni ports and halt French weapons sales. France is the world’s third largest arms exporter, with Saudi Arabia being one of its biggest beneficiaries: in 2016, Paris has reportedly approved licenses allegedly worth 18 billion euros ($22.11 billion) to Riyadh, and deliveries worth around 2 billion euros. French export licenses are approved by a committee headed by the Prime Minister and comprised of the foreign, defense and economy ministries.